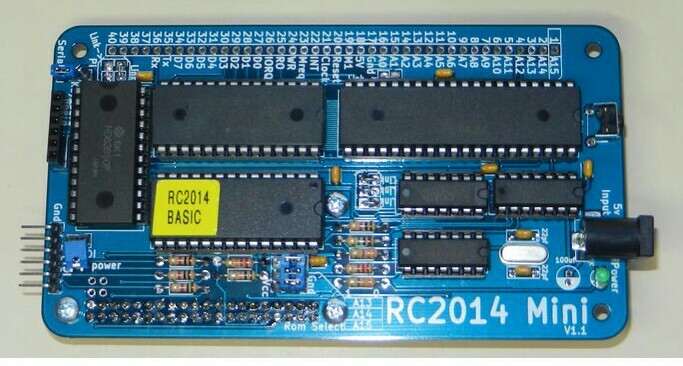 The RC2014 Mini is a single board computer which combines the CPU, ROM, RAM, Clock, Serial I/O and Pi Terminal of the classic modular RC2014 on to a single PCB. Having all the functions on a single board reduces the component count and therefore the amount of soldering compared to the modular equivalent. It also allows more efficient use of the logic chips. This efficiency comes at the expense of upgradability, where the modular option allows for any of the functions to be replaced if required. The likelihood of wanting to swap major components should be weighed up to determine if the modular or the Mini approach is right for you. The form factor has been designed such that it can plug in to the existing Backplane5 or Backplane8, thus reducing the amount of slots required compared to the modular approach. (Note that although it is exactly the same size as the Backplane5, and can neatly stack on top, this will block access to the other 4 slots unless they come out underneath!). The other modules, such as the Digital I/O Module can either plug straight in to the RC2014 Mini, or used via a backplane. There is a 2×20 way header which allows a Pi Zero to be connected below to allow HDMI output and USB keyboard input. This works with the same Pi image as the Pi Zero Serial Terminal. There is a jumper to set if keyboad input is to come from the Pi or from the FTDI/UMK. Overall schematic is shown below (click image for .pdf version), but for the detailed operation of each segment, see the appropriate module page.